Ring set for your 30mm tube scope in a low profile. Rings fit Weaver and Picatinny rails and feature Quick Detach for tool free installation and removal. Quality rings at great prices, built with great pride. low profile ring set for 30mm scope. 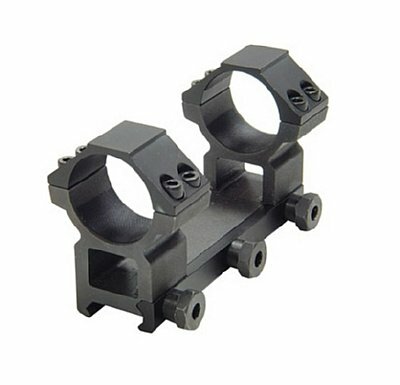 Max strength ring set is built tough, designed to hold your optics on target and are all metal. Rings fit Weaver and Picatinny rails, work with optics up to 65mm. Another David's Collectibles best seller. 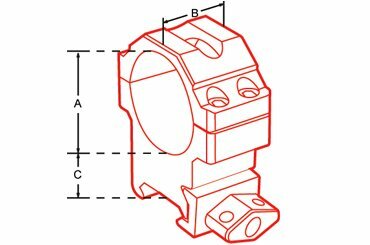 Max Strength H/D Grade Quick twist lock Picatinny Rings: 2PCs, 30mm Diam, Medium Profile Unit features 4 screws on each top cap. Twist tighten for trouble free fit to all rails. Precision Machined From Aircraft-grade Aluminum Alloy with Anodized Black Matte Finish. Robust and User Friendly fits any Picatinny or Weaver Rail. High Quality Synthetic Protective Tape Applied on Rings Internal Surface. Tight Tolerance Control and Repeatable Positive Locking for Optimal Re-zero Performance. Extensively Field Tested under Extreme Operations and Well Received by Field Experts and Law Enforcement Personnel. 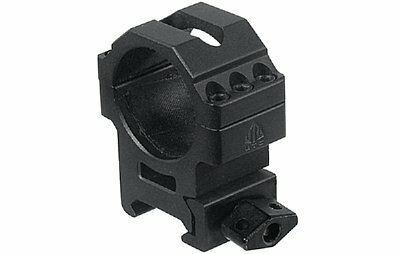 Accushot Ring set for Weaver/Picatinny rail with QD lever lock mounting. 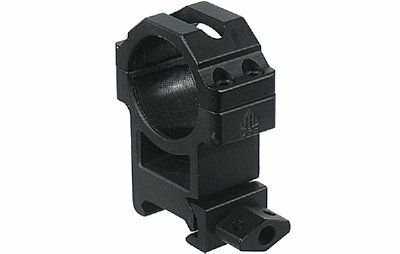 Heavy duty ring has 4 screws per cap for rock solid mounting of optic. This is for those that demand the best! Another David's Collectibles offering. This is a set of 2 rings. 4 screw per cap for excellent scope holding. Fits on Any Picatinny/Weaver Rail. High quality synthetic protective tape applied on rings internal surface. Tight tolerance control and repeatable positive locking for optimal re-zero performance. Rings are see thru design. Extensively field tested under extreme operations and well received by field experts and law enforcement personnel. You have a nice 30mm scope and why settle for rings that just do not work. 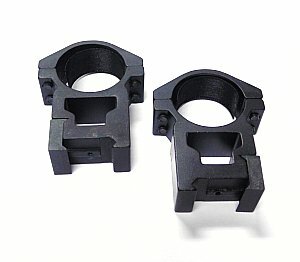 These great heavy duty rings fit your scope and Weaver or Picatinny rail nice and securely. Rings work with optics up to a 74mm objective. 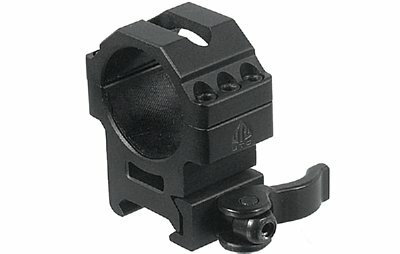 Rings are a see thru design allowing you to see your iron sights with scope mounted. This ring set is part of the Maximum Strength line, giving you more for your money. A David's Collectibles top rated best seller. 4-screw High Profile Heavy Duty Ring Set. Machined from Aircraft grade Aluminum Alloy with Heavy Duty Steel Locking Plate for Maximum Strength and Zero Holding. Twist Lock Design for Quick and User Friendly Easy Installation. Light Weight with See-through Tunnel and Slot Cut on Ring Top. High Quality Synthetic Protective Tape on Rings' Inner Surface to Protect Your Equipment. Optimized Dimensions for Best Fit on All Picatinny/Weaver Rails. Strong Recoil Stop Cross Bolt for Optimized Fit and Zero. Ring set for Weaver/Picatinny rail with QD lever lock mounting. 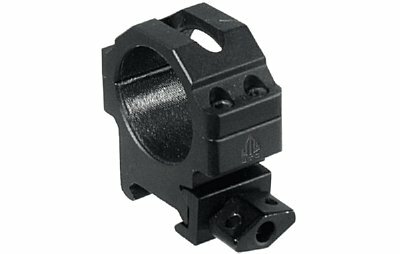 Heavy duty ring has 6 screws per cap for rock solid mounting of optic. This is for those that demand the best! Another David's Collectibles offering. This is a set of 2 rings. Fits on any Picatinny/Weaver rail. High quality synthetic protective tape applied on rings internal surface. Tight tolerance control and repeatable positive locking for optimal re-zero performance. Extensively field tested under extreme operations and well received by field experts and law enforcement Personnel. Great med profile ring set for 30mm inch scope. 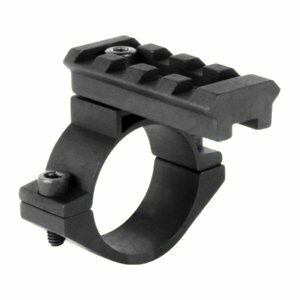 Max strength ring set is built tough, designed to hold your optics on target and are all metal. Rings fit Weaver and Picatinny rails, work with optics up to 45mm. Rings are see thru so you can see your iron sights. Another David's Collectibles best seller. 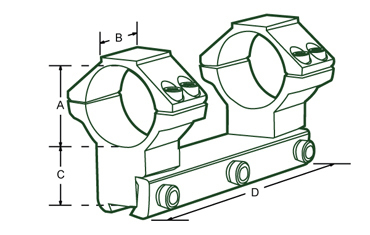 6-screw med profile ring set. Rings are machined from aircraft aluminum alloy with heavy duty steel locking plate for maximum strength for holding zero. Twist lock design for quick and user friendly easy installation. High quality synthetic protective tape on rings inner surface to protect your equipment. Optimized dimensions for best fit on all Picatinny and Weaver rails. Strong recoil stop cross bolt for optimized fit and zero. Light Weight with See-through Tunnel and Slot Cut on Ring Top. Just the ticket for mounting that dot or 30mm light or laser. Unit is built heavy duty and installs by lever lock. No need for tools to install or remove. This is a single ring mount. Another tickbitesupply offering. High profile ring set for 30mm scope. 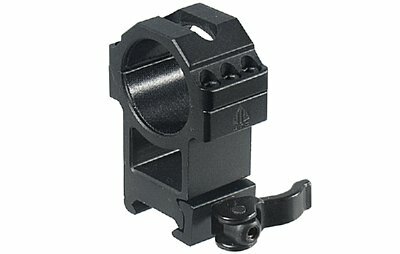 Accushot ring set is built tough, designed to hold your optics on target and are all metal. Rings fit all Weaver and Picatinny rails. 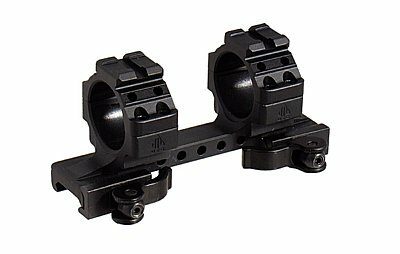 Work with optics up to 74mm. Another David's Collectibles best seller. Great ring set for your 30mm diameter tube scope. 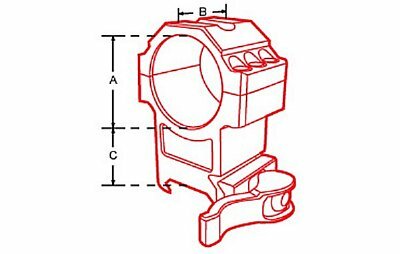 Works with scopes with up to a 56mm diameter objective. 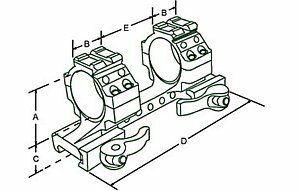 4 screws per cap for solid mounting and steel lugs keep rings from walking. All metal rings give great strength for accurate shots. See thru design, Another David's Collectibles great item. Space age rings are made with the finest materials for years of use. Four screws per ring cap for solid scope mounting. Inset screw for locking on your Weaver/Picatinny rail system. Fit scopes with objectives up to 56mm. See thru design in base of rings. 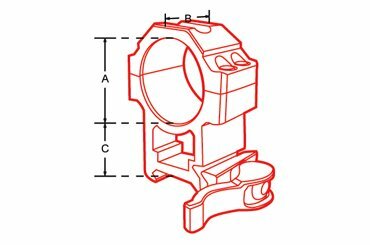 Height Base to ring bottom: 1"
Great 1 piece rail system for 30mm diameter scopes up to 56mm objective diameter. Fits Weaver and Picatinny rails. Heavy duty design mount is 4 5/8" long (100mm) and features 3 rail locking screws and one lock pin. Ring caps have 4 screws per cap for rock solid mounting. Another great David's Collectibles item. 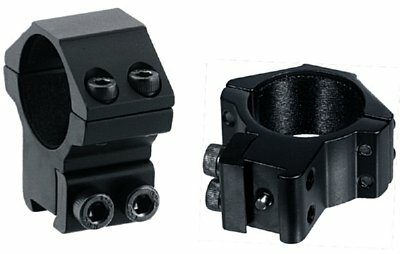 1-piece rail system for 30mm scopes. Ring mount fits all Weaver or Picatinny rails. Ring mount is made from precision machined aircraft-grade aluminum alloy with anodized black matte finish. Rings have 3 hex screws for great scope retention. 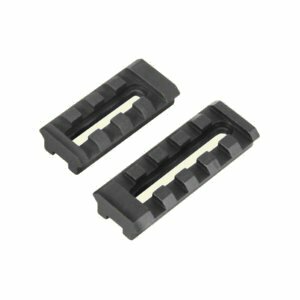 AccuShot Premium 1" Scope, 22/dovetail Style Base one piece Bi-directional ring set. 62MM Base length, fits scopes with a objective diameter of up to 56mm. 38MM bi-directional offset provides extended eye relief. Integral base provides great stability. Saddle height 0.84". 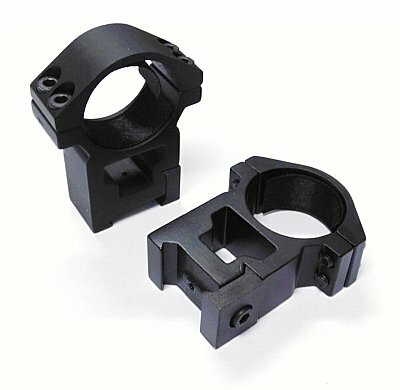 Medium profile ring set for 30 mm scope and Dovetail base. 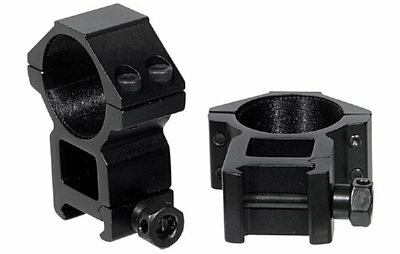 Accushot ring set is built tough, designed to hold your optics on target and are all metal. 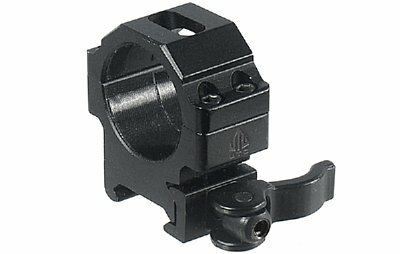 Rings fit Airgun/.22 3/8" Dovetail rail. Work with optics up to 50 mm. Another David's Collectibles best seller. AccuShot High Profile, fits objective up to 56mm, 30mm dia scope. Airgun/22 dovetail base, 21mm wide, 4 hex screws on top to tightly secure scope. 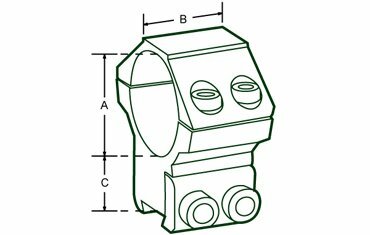 Features adjustible Stop-Pin for rock solid mounting! Great 1 piece rail system for 30mm diameter scopes up to 50mm objective diameter. Fits 3/8" dovetail and 11mm dovetail with its reversable locking plate. Heavy duty design mount is 4 5/8" long (100mm) and features 4 rail locking screws and one lock pin. Ring caps have 4 screws per cap for rock solid mounting. Another great David's Collectibles item! 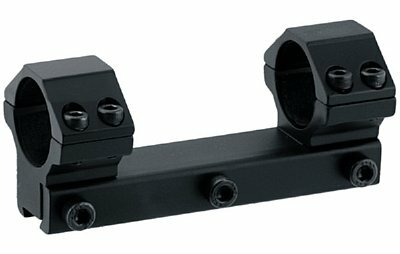 1-piece rail system for 30mm scopes. Ring mount fits rails with a dovetail platform. Ring mount is made from precision machined aircraft-grade aluminum alloy with anodized black matte finish. Rings have 4 hex screws for great scope retention. Full length locking plate to guarantee easy installation and secure fit. AccuShot Medium Profile Full Length 1pc ring set. Fits objective up to 56mm, 30mm dia scope. Airgun/22 dovetail base, four screws on each ring! 120mm Long, 4 hex screws on top to tightly secure scope. Low mount Ring for the Ruger style half moon reciever. Ring fits both 1inch and 30mm scopes. This is one ring, you will need to order 2 for use with a scope. Same Great Ring in Silver Finish! 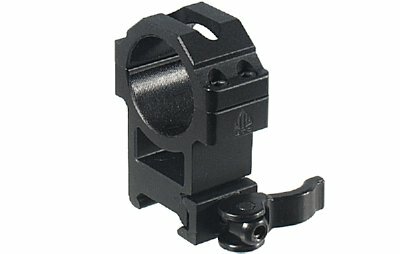 Canitilever Mount fits any Picatinny or Weaver rail system. 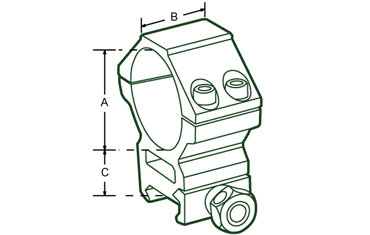 Allows mounting of lights, laser's or optics that are 1" in diameter. All metal construction. 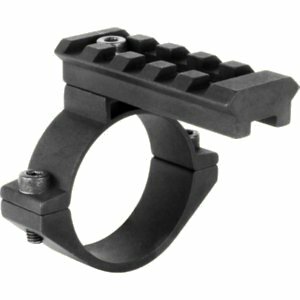 Great scope mount ring adapter. Goes around the scope and with the choice of 2 lengths of rail, allows the mounting of micro dots, lights or any of the accessories you need. Be sure your scope has appx 1/2" of space for the ring to go around. 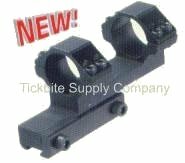 Great problem solver from tickbitesupply.com Rails can be adjusted for best position. • 2 Adjustable accessory rails 1.75"/2.25"